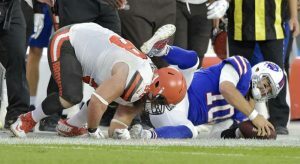 On Friday, Buffalo Bill quarterback AJ McCarron fractured his right collarbone during the team’s preseason game versus the Cleveland Browns, said reports from several sports news services. McCarron was the starter in the game and although sacked once during the first quarter remained playing into the second quarter. He ended 3-for-6 for 12 yards. In four series’ on offense with McCarron under center Friday, the first-team Bills offense gained just 7 net yards and no first downs. Following the game, Bills head coach Sean McDermott told reporters that all he knew was McCarron had suffered an injury to his right shoulder and would have further tests when the team returned. The Bills replaced McCarron with Josh Allen their first round draft pick who led the first-team offense down the field on a touchdown drive of 80 yards during the second quarter. Allen remained in the game for three possessions finishing 9-for13 for 60 yards with one touchdown pass. Allen’s touchdown pass was for 2 yards to wide receiver Rod Streater. The Bills replaced Allen with Nathan Peterman during the third quarter and went on to win the game 19-17. Buffalo has rotated quarterbacks during all of training camp and the first two games of preseason as part of a three-way competition to find the starting quarterback for the regular season. Peterman started last week’s preseason opener and was replaced by McCarrron who was 7-for-10 for 116 yards. During practices, first team snaps have been shared by McCarron and Peterman. McCarron signed a $10 million two-year deal with the Bills in March following four seasons with Cincinnati. Allen played well in the game and with the injury to McCarron the Bills may need more of him sooner than was expected. McDermott has said that the coaches would look at the game tape prior to making evaluations of their quarterbacks, especially if the injury to McCarron is a fracture, but he did say the team liked what they see with Allen. Thus far, said the Bills coach, Allen has been steady mentally, which is a great quality. He added that the players like that, and for a rookie to have that is important. Buffalo’s third preseason game is Sunday August 26 against the Cincinnati Bengals.